Little Brothers Friends of the Elderly hosted three dinners, including one at De La Salle Institute on the city's South Side. CHICAGO (WLS) -- Many are giving thanks at holiday feasts served across Chicago and the suburbs on Thursday. 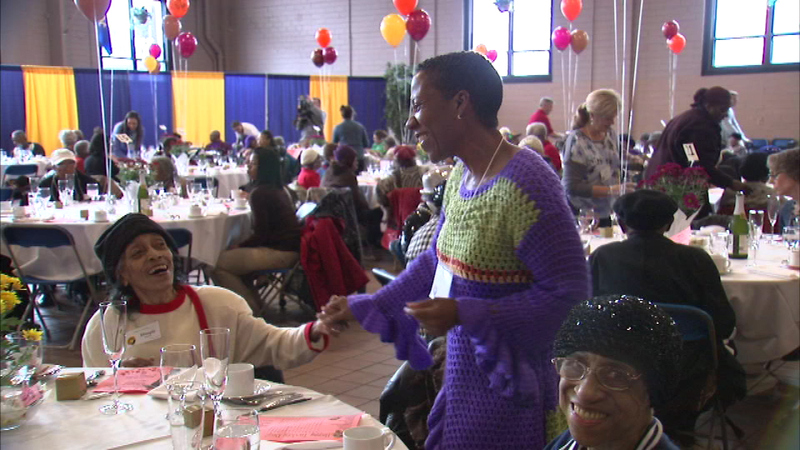 The party gave hundreds of seniors the chance to celebrate the holiday together with some music and a delicious meal. And for the 18th year in a row, Levy restaurants served Thanksgiving dinner at Pacific Garden Mission. The mission helps homeless men, women and children in Chicago's South Loop neighborhood. Residents enjoyed a traditional Thanksgiving feast with all the trimmings. The Salvation Army hosted several thanksgiving celebrations on Thursday, including this one at the Englewood Corps Red Shield center on the city's South Side. Volunteers from The Cheesecake Factory helped to prepare and serve a sit-down meal that included turkey with all the trimmings - and, of course, there was pumpkin cheesecake for dessert. All five aldermen from the Englewood community were there to offer their well wishes to the guests for the holiday. Volunteers with Catholic Charities served Thanksgiving dinner to hundreds of homeless men, women and families in the River North neighborhood on the city's North Side. They enjoyed a traditional feast courtesy of Chicago Cut Steakhouse. Governor Bruce Rauner donned an apron to help serve the Thanksgiving meal at Maple Park United Methodist Church in the West Pullman neighborhood on the city's Far South Side. The governor spoke briefly, saying he wanted to wish everyone in the state a happy holiday. Hundreds of people gathered at the Quinn Chapel AME Church on the South Side for a holiday prayer service. Many then stayed for a full Thanksgiving feast. Afterwards, some of the volunteers delivered meals to other church members who are homebound. A 15-year Thanksgiving tradition continued at St. John's Assyrian Christian Church in the Uptown neighborhood. Church members celebrated the holiday by cooking and serving traditional turkey dinners to about 500 people under a tent. The annual dinner helps those in need. This was the first year they held the event in the tent instead of in the church.